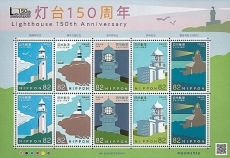 On 9 September 2018 Japan Post issued these five stamps along with a mini sheet. 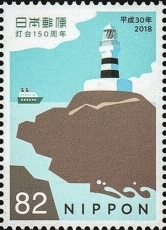 The first and last stamps show Kannonzaki L/H which is a major navigational beacon at the southwest entrance to Tokyo Bay near Yokosuka. 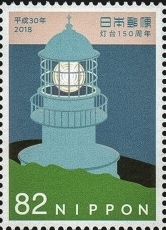 The second stamp shows Mikomoto Shima L/H. 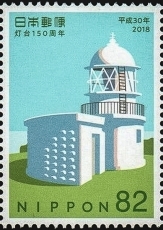 The next one, Muroto Shima L/H and finally He Shima L/H which is located at the western end of Japan’s Inland Sea and is one of the oldest lighthouses in Japan. On 26 Apr 2016, Japan issued a sheet of 10 stamps to commemorate the G7 Ise-Shima Summit. 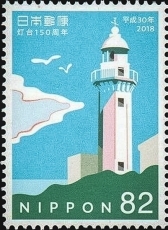 One of the stamps shows Daio Saki Lighthouse. This aid to navigation was built after a Japanese naval vessel wrecked on a nearby shoal. The second sheet was issued on 8 July 2016 in the “World Heritage” series. 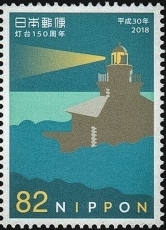 No lighthouses are shown on any of the 10 stamps but Hizen Ha Shima Lighthouse is visible (marked with the red arrow) at the upper part of the sheet. This lighthouse is located on a small island about 15 miles southwest of Nagasaki.